Garry Dodd (pictured) and Dawn Morgan emerged as winners in the showpiece men's and women's events during finals night from the 2016 Island Championships on Saturday evening at the GTTA centre. 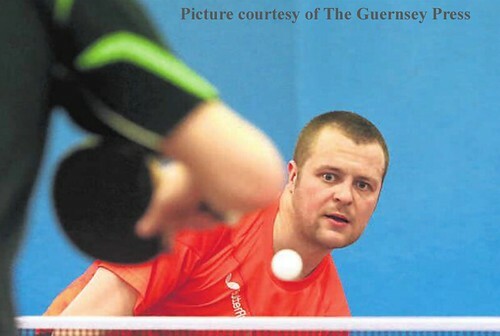 Dodd regained his Guernsey men's singles title courtesy of a straight game win over Olly Langlois after having already teamed up with Paul Hainsworth to take the men's doubles crown courtesy of a tight seven-game win over the Stacey twins, Joshua and Lawrence. Morgan was clinical during her women's singles clash against Kay Chivers and won in straight games before later joining forces with Chivers to pick up the women's doubles crown via a 4-0 victory over the junior pairing of Chloe Le Tissier and Charlotte Casey. Le Tissier had success in the mixed doubles, teaming up with Liam Robilliard to beat Langlois and Casey 4-3. Other winners on the night included lan Fitchet (070 singles), Derek Webb (060 singles), Mark Pipet (super veterans' singles), Phil Ogier (veterans singles), Josh Butler (U21 singles) and Langlois (restricted singles).